Edition of 199 copies. Resissue of the cassette from 1997. 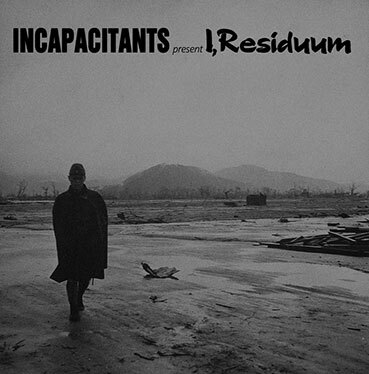 "Incapacitants are the best noise band to ever come out of Japan. The group was formed in 1981 in Osaka, as the solo project of Toshiji Mikawa, a member of the amazing noise group Hijokaidan. Mikawa, a bank employee, later moved to Tokyo, where he joined with government office worker Fumio Kosakai (also an occasional member of Hijokaidan, as well as a former member of C.C.C.C.) to make Incapacitants a duo. Toshiji Mikawa and Fumio Kosakai are no ordinary salarymen, though. They've been making some of the most unremittingly ear-shattering racket for decades as Incapacitants, one of the most significant noise outfits to emerge from the groundbreaking Japanese scene in the early 1980s, and still one of the most radical and powerful. They've consistently been responsible for some of the most complex, chaotic, loud, and downright fun releases in the genre. The holy grail comes with “I, Residuum” , a devastating release from 1997, whose sound is particularly impressive, painfully dense and full of detail – there's very little air to breathe here. It's basically an Incapacitants all-in-one featuring the trademark frenzy, exciting psychedelics and sonic bulldoze, all sounding crystal clear. Just pure, unadulterated electronic distortion of the highest quality done by two of the masters who have ever turned the knob on a distortion pedal that is fun, terrifying, hypnotic and fascinating all at the same time; their noise takes root not in violence or gimmickry, but in pure energy. Incapacitants create inexhaustible chaos verging on the sublime, and take you on a truly excruciating journey toward catharsis. This is truly the spirit of noise: no macho posturing, no pseudo-intellectualism, no "rocking out," no pretense! Reissued for the first time in vinyl, the record has been pressed on 140 gr black vinyl with black label and black inner sleeve and comes in a deluxe silver silkscreen on black cardboard sleeve in 199 copies."